A visit to the "Home Show" prompts Lucy and Ethel to dream of households with new furniture. A contest, in which they each entered one hundred cards, will award the lucky winner with five rooms of new furnishings. All the wives have to do is wait for a phone call from the "Home Show" the next day; but Ricky has managed to obtain four tickets to the "new Rodgers and Hammerstein musical." Temptation notwithstanding, Lucy opts to wait for the all-important phone call. So he can attend the musical, Ricky asks Fred to make a phony phone call informing Lucy she has won. Naturally, when the call comes through Lucy is elated and immediately summons a secondhand furniture dealer. For seventy-five dollars, she sells dealer Dan Jenkins all her furniture and promptly spends the cash on new paint and wallpaper to brighten the apartment. The scene depicting Lucy and Ethel wallpapering the Ricardo bedroom is priceless. When Ricky arrives home and learns that Lucy has sold all their furniture, he chases after Jenkins to buy it back. The price, after dealer adds on for "overhead, electricity, advertising", five hundred dollars. Ricky manages to wheedle Jenkins down to three hundred and ninety-five dollars, but only because "I like the way you sing 'Babalu.'" After viewing the new striped wallpaper in the bedroom, Ricky learns from Fred that he never made the phony "Home Show" phone call, which means that Lucy really did win the furniture. Special Notes: This episode was prompted by Lucille Ball, who said of the existing stage furniture, "I just got tired of it." 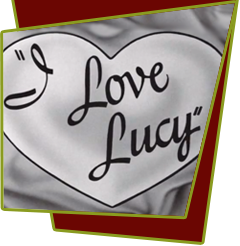 This episode is based on lucy's radio show, My Favorite Husband, Episode #36, "Giveaway Program". Bloopers: Fred can be seen waiting for his cue to enter the bedroom when Ricky first enters the room. Ricky claims to have gotten tickets for the opening night of a new Rodgers and Hammerstein show. Although "South Pacific" and "The King and I" were still playing on Broadway at the time the show was filmed and aired, there was no new Rodgers and Hammerstein show until "Me and Juliet" in May 1953.